This Yeomen is easily one of the most reviled entries in the Brent Walker video series. Generally well-cast, marvellously appointed, and directed by a G&S veteran (Besch), this should have been a superb production. However, it is killed by the horrible choice of Joel Grey as Jack Point. Grey's dull-as-dishwater performance misses all the fun in the part, and his death at the end comes as a relief for all the wrong reasons. Grey also speaks in an American accent, which jars with the spirit of the piece and with all of the other actors. Many of the remaining roles are far more successful, such as Alfred Marks's Wilfred and Claire Powell's Phoebe. The overall impression, however, is of a golden opportunity missed. Grey is hopelessly under-rehearsed in this production, to the point that he actually flubs lines from time to time (spoken and sung). He has, nonetheless, a vulnerable quality of a good, if totally ordinary, man who has never gotten a break. He is not that good a jester; he is an absolute failure as a lover; his health is questionable; he is a man who does not do unto, but in turn is done unto. My first reaction on hearing that he was going to be playing the part was something along the lines of "Oh really!" But in spite of an American approach, if not more specifically New York, I am convinced that given sufficient time to prepare the role, he could have done truly memorable things. It is overstating, in my opinion, to say that Grey "kills" the performance. I agree substantially with Stan German's comments. To these, I would add that Grey's performance is a moving one, although it certainly is not informed by the tradition. His American accent bothers many people; for me, it merely emphasizes his outsider status. What you can't take away from Grey is his sincerity and his integrity. The production seems to exist in at least three versions, and possibly more. As broadcast in the U.S. on PBS, the production was heavily cut, omitting considerable amounts of dialogue, the first verse of "When maiden loves," and the following six numbers in their entirety. All versions sold on home video also have these cuts. However, as originally broadcast on the BBC in 1986, four of the six numbers (all except "Alas, I waver to and fro" and "Free from his fetters grim") were included. Peter Parker performed a detailed comparison of the BBC broadcast and several of the commercial videos. It seems clear that the cuts in the PBS version were not originally intended, and were made only to bring the production within PBS's two-hour time requirement. For example, the soloists position themselves as if they are about to sing "Strange adventure," but then the camera cuts to the next scene. The elimination of Elsie's dialogue scene with Fairfax and Meryll's scene with Carruthers makes the final pairings seem totally unmotivated. 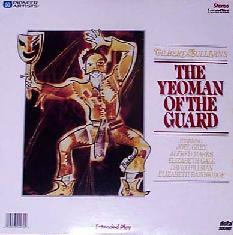 Furthermore, as Michael Walters has observed, Michael Bulman (Leonard Meryll) is a well known tenor. At the point when he was engaged, the producers must have intended to include "Alas, I waver to and fro"; otherwise, an actor would have sufficed (and would have been much cheaper). Notice misspelling of the opera's title. I wrote the liner notes for the four Walker G&S productions that were issued on Pioneer LaserDiscs in the 1980's. 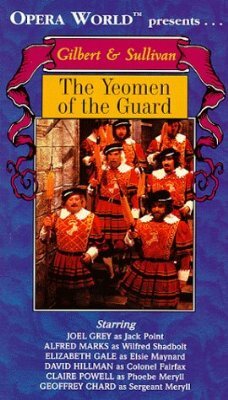 In the case of Yeomen, I structured my whole essay around "Is life a boon," and then when I received the videos was shocked to see it was not included. Ron Rich who was in charge of Pioneer Laser at that time, contacted Judith DePaul, and we recieved out-takes of "Is life a boon," which is on the Pioneer LaserDisc issue. "Is life a boon," "Strange adventure," and "When a wooer goes a-wooing" are all listed on the Side1/Side 2 table of contents. Also, they are contained in their entirety within the performance, although they show signs of being edited into it. "Rapture, rapture" is missing. Because of Dame Curruthers's brief appearance through a window during which she is shown overhearing everything, as well as a jarring cut in the dialogue, it obviously was intended to be there. Total running time is given as 115 minutes. We can probably conclude that had "Rapture, rapture" been included, it would have been an even 120 minutes. The insertion of "Is life a boon" may also contain dialogue which was cut from the VHS version. Following Fairfax's line, "…gives due notice of his advent, that one might not be taken unawares," there is a bad cut, after which we have Phoebe's "Father, I cannot bear it." The video quality seems to improve from this line onward, through more dialogue and the song. The new material seems to end with Fairfax's "And now, Sir Richard, I have a boon to beg." Apparent cut. He continues, "I am in that strait…"
The insertion of "Strange adventure" and "When a wooer goes a-wooing" are both done identically. Following the dialogue scene, the groups are faded in from a distant angle, although they have not moved, apparently. The music for both also ends similarly, with fades to closeups, and dialogue. From the existing continuity, is seems likely that neither "Alas, I waver" nor "Free from his feters grim" were ever intended to be included in this production. The dialogue and movement move seamlessly forward. These musical numbers may well have been contemplated, and perhaps even staged, but unless alternate versions were filmed (given the circumstances of the production schedule, not likely), they did not even make it to the cutting room floor. By the way, the only verse of "When maiden loves" included is the second verse; the first verse is omitted. There is a fade/cut which makes it difficult to say this conclusively, but it appears that the first verse was not filmed from the continuity on the laser disc. It seems apparent that there are other dialogue cuts as well, but I did not go through it for this purpose. So, to summarize: the three known versions, in order of decreasing length, are the original BBC broadcast, the Pioneer videodisc issue, and the PBS/home video version. 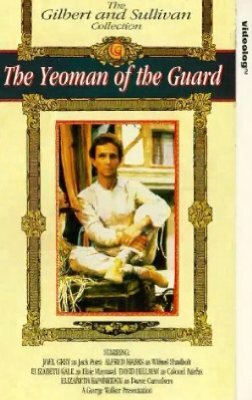 The casting of a tenor as Leonard Meryll suggests that "Alas, I waver to and fro" could have been taped, but it probably never made it into any edit of the production. Peter Parker made some very diligent efforts to locate the producers, to see if the original version could be salvaged, but to no avail. The Brent Walker company was liquidated long ago, and the producers have dispersed to the four winds. 2002 Acorn Media DVD AMP-5343 Available only in a 10-disc boxed set (cat. AMP-5483) including the entire Brent Walker series, excepting Trial and Cox and Box.